It is for nobody really easy to become familiar with an unfamiliar subject area. So it should fare well with many new members on Ougos. With this short guide we give you first interesting insights into how Ougos works, how you can earn credits and finally we will show you the potential of Ougos; what you could use our service anywhere. The guide focuses primarily on new members. 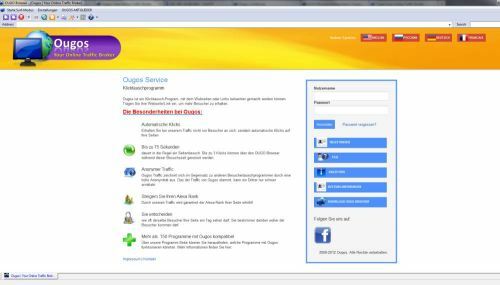 Registrate on our website www.ougos.com. After you have successfully sign up on www.ougos.com as a member, you will receive from us an e-mail with confirmation link. Confirm your registration to www.ougos.com and log in to your account. On the first page is a dashboard. There are displayed the basic data from your account. Among these data are also two links. One link is used for refering new members to Ougos. You can insert this link in forums or even on your website. The second link is necessary for earning credits. This link, you must insert in the OUGO browser (more on that later). Credits can be equated with points. You need those points to receive visitors. To receive on visitor to your site, you need one point. For 10 users, you need 10 points, etc. Points are earned through OUGO browser. 3. Go to navigation on "Ougos Members" and click on ENTER OUGOS LINK HERE. The OUGOS Link you can find into your account on www.ougos.com on the first site (Dashboard). Once you have paste your Ougos Link into the field in OUGO Browser, please click on the button OK (see image below). You have enter OUGOS-Link in OUGO Browser,congratulations! How to surf with OUGO Browser? 1. Go to navigation on "Start Surf Modus"and click either one, two, four or six pages. One, two, four or six pages regulates how many pages you will visit at the same times. Most members use the option "six pages", because you can the most credits in a few time. You are ready! Congratulations!. Now you are earning your first credits on Ougos! 1. OUGO Browser running in the background: This function allows you to surf without disturbing at the same time running OUGO Browser. To activate this function, stop surfing! Go to navgigation to "Tools" and click on "OUGO Browser options". A new window in browser should appear. Click on "Tray options" and check there the first two fields. Then click on Apply and OK. This setting will be save. Now you can continue surf modus. Now, if you should minimize the browser, OUGO Browser will run in background! 2. Slow internet connection: Do you have only a slow connection? No problem! Then go to navigation on "Tools" and deactivate "Display images, animations, sounds and videos" Please note, that these settings have affects to the settings of Internet Explorer! 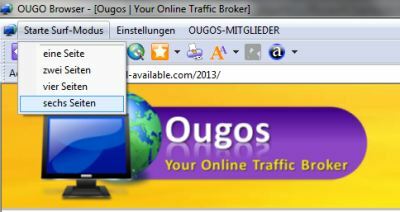 Websites will add in your member's account on www.ougos.com under "My Links". Here you can decide to what time may be visited your site, how often the same visitor may see your site per day and from which countries a visitor should comes from. Then have made a decision to all of that, please click on OK and you will receive from us a message, that your was successfully registered on Ougos. Because of security reasons, we will review your website, before our members will visit your website. In general the review normally be made within 24 hours, in exceptional situations, such as holidas, etc. review will be made within 72 hours. Tip: We recommend to surf now! Until we approve your website in our system, it could be take up to 24 hours. Use this time to surf credits! Once your site is approved, you have already some credits to get traffic from us to your website!